Meghan Marohn is terrible at small talk. She'll tell you so herself. But if you want to talk about the meaning of life—or love, time, repetition, or the Collar City Bridge—Meghan is happy to oblige. 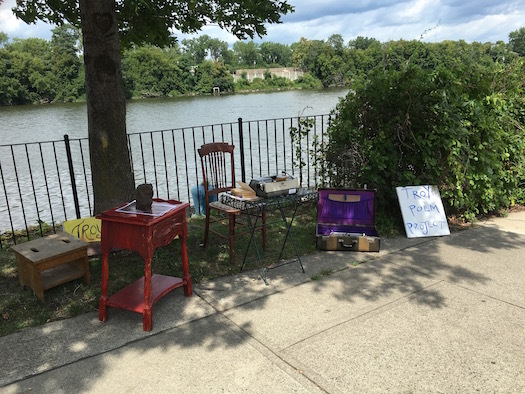 You'll find her sitting by the river at Troy Flea, or along River Street at the Enchanted City festival or Troy Night Out. 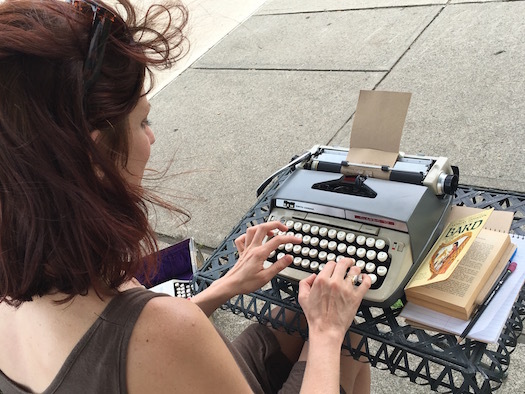 She's the red-haired writer behind the manual typewriter next to the sign that reads: Troy Poem Project. Tell her about a person, a place, a feeling, an idea—whatever is on your mind. 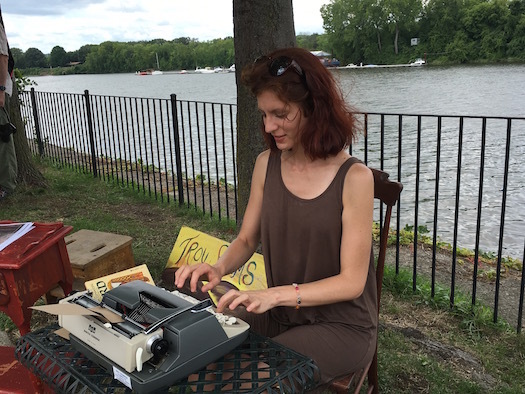 Twenty minutes later, she'll hand you a poem, something fresh and new, your thoughts, distilled, refined, milled into metaphors for you to consider in a new way. 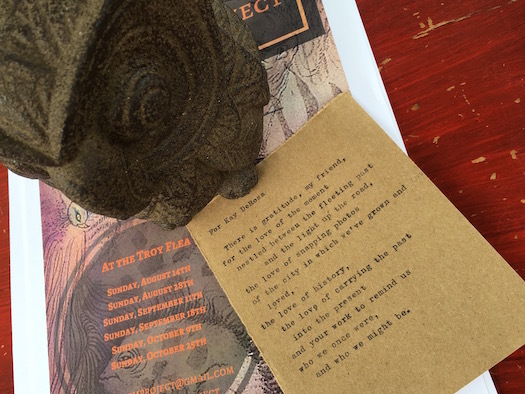 The Troy Poem Project, she says, is about more than poetry. It's really an effort to get to know people in a different way, and, if only for a moment, change the way we communicate in this busy world. How did the Troy Poetry Project start? What were you trying to do? I think maybe I was just desiring a creative outlet and wanted to connect to people in a different way. I'm a mediocre-to-not-so-great small talker and I just wanted to connect with people on the things that I am thinking about. Also, I was working with kids and realizing they are thinking about stuff all the time—they are just not talking about it. And then they think they can't talk about those things. And then they start to feel weird or different. I do writing workshops with them and they write about things like time, who they love, who they are -- all of those big things. I think people are walking around with those things and not really expressing them and connecting with other people. I started reading last summer about this woman, Jacqueline Suskin. She does this at different flea markets. I've heard about people doing it in Grand Central and other places. So it's not new. I was a little worried about doing it at first. I thought maybe people would think it was weird. But my friends and family were so supportive about it and it's not hurting anybody. A man walked up to me in the market once and said, "I think this really pretentious." But then he came back later and said, "I thought about it and I think you are doing a good thing." If other people want to join me, I welcome it. It's not about me. It's about connecting with people. It's kind of a reminder about what good conversation could and should be. 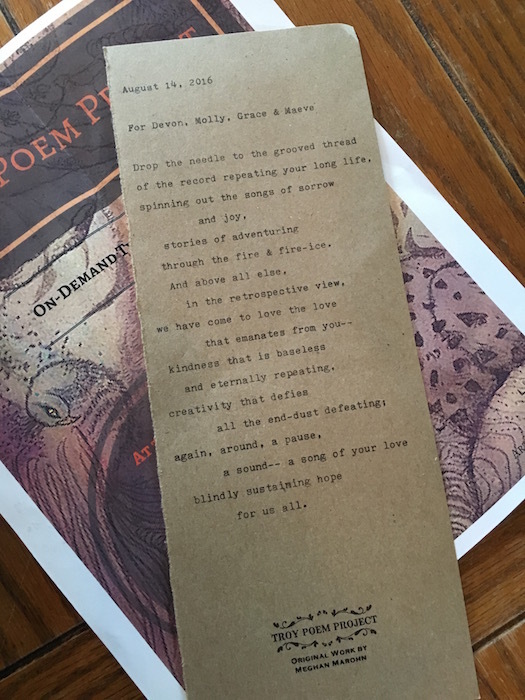 What about the form—why poetry? The social idea of normal doesn't allow us to get to get too deep with people, so the poem almost helps you to get deeper -- reframing reality. It's not about me reframing their reality, but, in talking with them for a little while, it helps us both get at things in a different way. In a deeper way. Maybe in a non-conventional or non-"normal" way, but one that is important in thinking about life or a situation. The poem can be, not just aesthetic, but useful. One of my favorite writers says the artist shapes pain into an arrow rather than a wound. In other words, you don't listen to sad music because you are sad—the musician, or the artist, gives you something to work with—a new way to express that sadness. An arrow rather than a wound. The poem can be a useful tool. If you can aestheticize your anger or sadness, it's not destructive. Happy poems can be about gratitude and memorializing the good things in each other. I'm lucky in the rest of my life because I'm an English teacher and I have been thinking about poetry a lot and this puts in to practical use a lot of the ideas I'm thinking about. As I said, I'm not always the best at small talk. My brain tends to go to modernist literature and existentialist philosophy. That can be boring to some people. But people have a hunger for culture. I think your average person is just hungry for more culture, and this is a way of just sort of talking about bigger ideas. What do you say to get past the small talk and get them to open up? I think that the conversation beforehand is really important. You don't want it to be off base. Every time I'm at the market someone will ask if can write a poem for their wife or boyfriend, and that is a little tricky because I don't know the wife or boyfriend. So I ask questions. "Do you want this to be a love poem or a poem about a particular experience or particular moment?" And the question that has been helpful lately is: "What do they love and what do you love together?" I'm not trying to be cute—but getting them to talk about what that person loves is a way for you to get at who he really is. I wrote a poem for a woman's husband and he is very creative and ingenuitive. When he was in his 20s he started a business crafting fins to help people swim, and he is great at inventing things and not giving up and not caring if he is a failure, just trying again. I ask about what music they love, what sports, what experiences. Asking about their passion and experience kind of helps to focalize it. What are some of the poems that have moved you or surprised you in some way? The very first one I was ever asked to write was by a woman who is a social worker. She said she led a group of people in Troy who have mental health and substance abuse issues. Some have been in prison. She said, "We are mediating on anger now. Can you write a poem about, maybe, the positive parts of anger? The fact that it can be an alert to a certain truth. And that you can't help how you feel, but how to get distance on anger." Last summer another woman walked up to me and said she was visiting Troy for the first time. She was from San Francisco and had a speaking engagement here. She wrote an anti-bullying children's book called One. She said she wanted a poem on communication and people treating each other kindly in the adult sphere. She had a miscommunication with someone and she wanted a poem on communication and kindness and openness and how you do that in 2016 when things are more fragmented. People ask me to writing about meaning. What is the meaning of this life? And then on the other end of things maybe writing about the sturgeon in the Hudson River. I know nothing about sturgeon. I just thought about fish (laughs). Metaphors about fish. And I wrote a poem about the Collar City Bridge for someone. I'll write about almost anything. Nothing too nihilistic -- it's supposed to be an idealistic venture. Has talking to so many people about the important stuff changed you? Definitely. I think it helps to open up conversations with strangers in different ways. I want everybody who comes by who wants a poem to get a poem—so it's donation run. It's made me realized how much of our social interactions are motivated by capitalism. Since it's donation run, it's just bringing me in contact with a wide swath of people—rich, poor, old, young—and it is kind of exciting to be able to communicate with people in a different way. So it's not just, here is your change—that's not what it's supposed to be about. I received $150 for a poem, but someone has also handed me a penny. I work on trade sometimes. I've worked for burritos—but it's not supposed to be a business venture. It's about talking. Sometimes I just talk to people, I never pressure anyone. 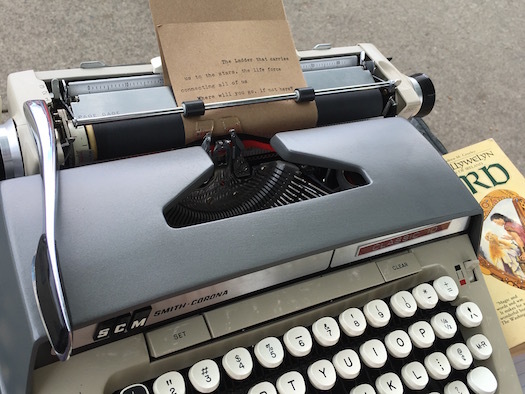 Sometimes the typewriter itself, just the sound of the little bell at the end of the line, opens up the conversation. I've written quite a few memorial poems and wedding poems and Christmas present poems for family members. It puts me in contact with people in a different way. You've written all of these poems now—are you planning to do anything with them? I would like to put something together. I've done a few poetry readings and I'd like to have an anthology or collection or a little book that would be of interest to people in Troy, but also, hopefully, of interest to anybody. It might be nice to have a visual display. I've tried to make the poems visually appealing. A friend got me a stamp to put on them. They would be more abstract impressions and also memorializations of life in Troy. That is what seems to be coming out.